As your wedding guests walk into your wedding reception space, would you like to wow! your wedding guests! This article talks about some of the things you can do to really create a beautiful wedding reception! If your decorate your wedding properly, you can turn your reception into a feel of a very special event, a magical event, an event your wedding guest's will always remember! Before you get started on decorating your wedding reception, you need to work on decoration inspiration ideas. You want start keeping a notepad full of ideas. This notepad can be a section in a wedding organizer or in a wedding planner. Sometimes you might doodle ideas. You also might keep a diary on decorations ideas. Whenever a decoration thought comes into your head, write the thought down while the thought is fresh in your head. You want to spend a couple of weeks or months generating decorating ideas. You want to get ideas by looking at lots and lots and lots of websites, magazines, Inspiration Boards such as Pinterest looking at decorations, flowers, wedding reception halls, wedding cakes, and food. You can also stop at book stores or libraries and glance at a few magazines there. Also brainstorm ideas with family and friends and if you are working with a wedding planner them too. Anything that captures your interest either cut out or print out the picture and place it into a baggy and staple it to your wedding organizer or planner or keep in a folder. Finally when you think you are ready, the best time is about five months before your wedding, you want to start thinking about decorations for your wedding. You want to stop by your reception space and talk to the venue wedding coordinator or reception manager and get back from them are there decoration restrictions, also what the natural colors of the venue is, and what decoration supplies they have including what colored linens. Ask if you can bring your own colored linens? If you have a camera to use, you might take pictures of the natural décor of the place and take pictures of spaces you would control for your wedding. After you get back, you can start thinking about a wedding theme or a color scheme. Use a color wheel to help you decide on colors to use. Usually when you use a color wheel you choose a primary color and the shades surrounding your primary color. You could also use opposite colors which is red and green, blue and yellow, or purple and orange, or an opposite shade. White and a primary color goes together too! Once you come up with a color scheme, you should try to apply your color scheme in many wedding factions! You should apply your color scheme in bridesmaids dresses, table linens, buffet table linens, fabric napkins, chair covers, bow ribbons, bridesmaids accessories including shoes, bridesmaid purse clutches and hair accessories and earrings, groomsmen boutonnieres and Hudson pockets, wedding bouquets, floral arrangements, wedding cake décor, wedding invitation designs, wedding programs, candy buffet tables, wedding favor wrappings, ribbons, and wedding reception table centerpieces. Groomsmen shirts and ties possibly could be color schemed but don't have to be. You also could apply a wedding theme to wedding factions too! For example your wedding theme could be Pirates, you would use heavy pirate decorations or it could be seashells and many decorations would be seashell. 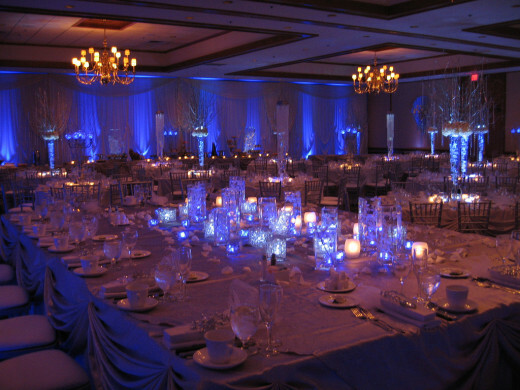 You want your reception to have strong coordinated coloring or themes and this creates the wow effect! You might consult with a florist and come up with a beautiful wedding bouquet or a floral design before coming up with a color scheme. The next question is, who is going to come up with, plan, buy, and lay out your wedding decorations. Are you going to do wedding decorations yourself or are you going to find someone to handle decorations. If you decide to go with a decorator, you will need to come up with a wedding decorating budget? You might derive a decorating budget by finding a wedding calculator and calculate what the average wedding decorating budget versus the average toal decorating budget and apply that percentage to your total budget. 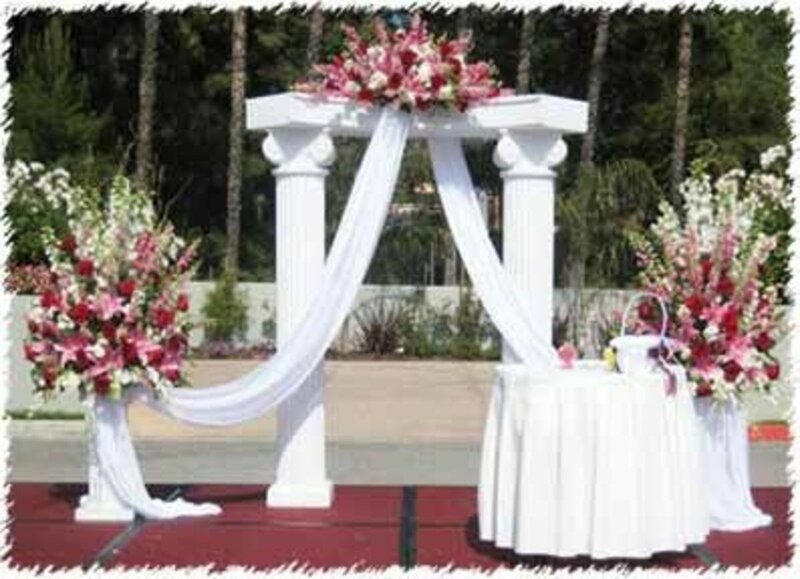 When it comes to weddings there are many types of wedding vendors, many brides will do the decorating herself usually with the help of volunteers, there are also true wedding decorators, there are party decorators, the event planner, there are wedding planners that also do wedding decorating, wedding planners can also find you wedding decorators, many florists do wedding decorating with a heavy emphasis on floral decorating and some balloon companies do wedding decorating too. You have many choices, if you have the time, you can decorate the wedding reception yourself and impress your guests or you can find one of these decorating experts to do it for you. 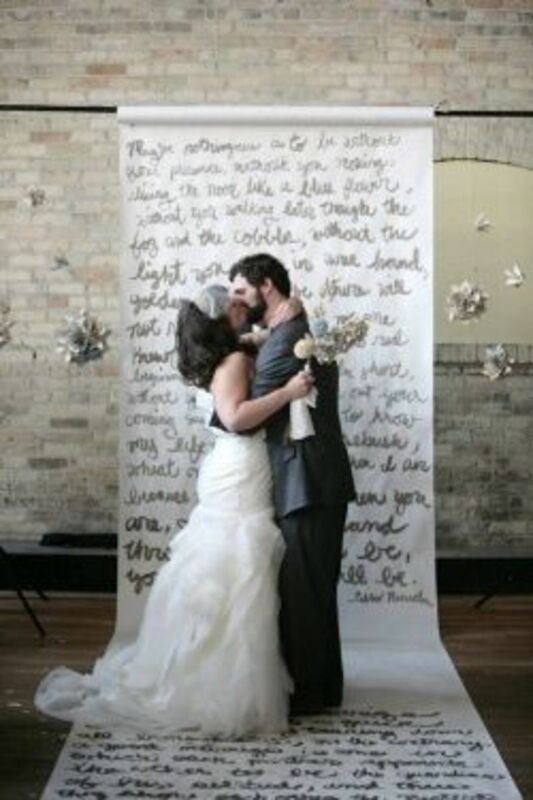 Meet and interview a few decorators before deciding one to design your wedding space. You should have a wedding budget, a good idea is to give a budget number in a range with your budget as a high number in your range. You should give your decorator, the date, time, and location of your wedding reception, also the location of your ceremony site. You should also share your ideas on a wedding theme and color scheme. You should also share your baggy of pictures that captured your attention or doodles of designs and ideas. In your interview with the decorator, ask about their background? Ask them about their experience and training they have, ask them if they have a brochure of pictures of wedding receptions they have created before? In your interview, you want to focus om their style of decorating for table place settings, table linens, chair decorations, buffet table decorations, room decorations, wedding cake design, and table centerpiece decorations. There are two personality types of decorators. One personality type of decorator is a decorator who works one on one with you. A decorator who discusses ideas, investigates possibilities, reports back to you, discusses possibilities, gains your approval, and takes action. The second personality of decorator, meets with you, finds what you are looking for, and runs with it. What type of decorator do you want, one in which you are heavily involved or one that runs with it. You could be pleasantly surprised or be disappointed. The decorator you choose should be one that has your sense of style, someone you trust, someone who you are comfortable communicating with, has a pleasant personality, has had good training, has shown good decorating skills, and can work with your budget. As you begin your wedding reception space, the first thing you need is a layout template that shows where all your reception tables, chairs, buffet tables, head table, wedding cake table, gift table, musician's station, and dance floor will be. You want to be sure that there is enough seat locations for all the wedding guests, that each seat can be easily gotten into and out of the seats well. The floor space is laid out conveniently for the catering staff and wait staff and you identify a spot in which wedding guests can go to escape to to talk to an old friend should noise or music get too loud. Some reception halls can provide you with their floor template or you can find a floor template online. Next you need to put a focus on linen needs, you want to find linens that match to your color scheme, you need count how many reception tables you will have and how many linens you will need for them and what size you will need and do they same for your head table, buffet table, and other tables such as servants tables, wedding cake table and wedding gift table. You need to see if your reception facility has table linens in your color scheme or might you have to special order them. You also might think to extra decorate your table linens. You can swag and overlay the sides or your reception tables, swag is a curvature technique where the linen gets pinned at equivalent spots going around the table with a pretty design. There are other designs with linens you can do, you can have one linen larger than the other using one color shade darker and another shade lighter. You can hang tulle or gossamer fabric forming graceful arcs from your head table and buffet tables, you can wrap the tulle fabric in a spiral fashion. The length of fabric you will need is about two to three times the length of the tables, depending how far you want the fabric to hang. You can add white decorator holiday lights, Christmas lights, or color schemed lights if you would like inside the tulle fabric, the amount of lights you will need is about one and a half times of the length of the table. Make sure the lights reach a nearby outlet, and secure the lights to the front of the table using masking tape and secure the cord vertically running up the table. Secure the cord on the floor and make sure all lights are on the backside of the tulle fabric. Secure the lights to the far ends of the reception table with a large safety pin running through the tulle. The buffet tables also can also be decorated alternating a darker and lighter color schemed linen fabric. You will end up with beautiful looking drapery along the entire length of the head table and buffet tables and the look enhanced by underneath pin lighting. On top of the head table and buffet tables you might want to decorate the a little with floral arrangements. Your wedding cake table is preferably round and located away from any wall so it's a good spot for picture taking. Also located away from the dance floor or high traffic area so it doesn't get bumped. Next focus on your reception seating. There are different things you can do with your reception chairs. You can use color schemed chair covers, or you can place color schemed ribbon bows on the back of each chair, or you can place a strip of a hanging ribbon, or you can hang a color schemed or wedding theme balloon on the back of each chair. If you have sofas in or near the reception area you can cover the sofa with a color schemed cover and cover pillows in a slightly different shade of your color scheme. For your place settings, you want some type of fine china that looks good with your color scheme. You don't have to color scheme your dishes. You want beautiful china and nice shiny flatware. If you want to color scheme your plates a little you can use a color schemed charger plate which is your bottom big plate at your table place setting. It may look a color schemed a little by having a wrapped color schemed favor on the top of the plate. At the front of your reception entrance, you might have a couple of tables. Color scheme your tables there too. One table might be your guest book. 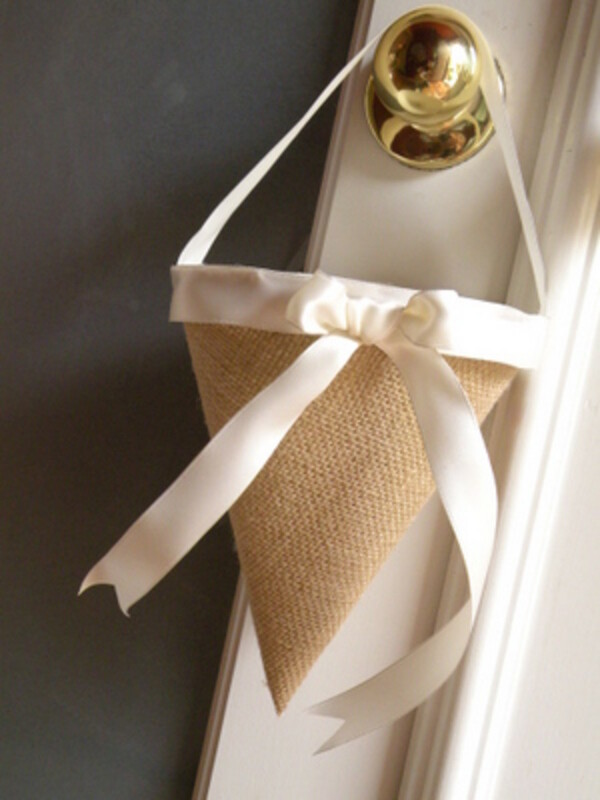 Decorate your guest book with color schemed linen, and in the back maybe a vase with color schemed flowers. You might include a small easel with a photo of the wedding couple and a little mint dish. Make sure you have a guest book that will last a lifetime and a good writing pen that is full of ink that won't smudge and writes the first time. At each table place setting you should put a decorative place card, you can number or give a name to each table. Have fun with naming tables, name each table for a famous honeymoon location, ports for cruise stops, a cartoon character, Hollywood or television stars, or after a hobby that the bride or groom has. If you have a lot of guests, near the front entrance you should have seating placards. The placards can be set up a number of different ways. They can be folded with last name in alphabetical order. The cards can be placed in a number of rows or they can be placed in a circle. Seating charts can also be set up in alphabetical order using a clothesline design. You could also show seating by using a big poster board on an easel or wall. You can show the floor design of tables and place names in alphabetical order inside the table rectangles or circles. You can also place the name of each wedding guest's seat. Some family's create a blow up photo of the wedding couple and place their picture on the photo on an easel by the entrance. You have color schemed your wedding reception space, and now you can add the wow! The wow is done by adding a little ambient lighting. You might want to use a little accent lighting, light that is near your color of your color scheme. Lighting sets up a mood. The lighting you don't want too bright or too dim, you want sufficient lighting so you can clearly see who the people are around you. The lighting itself you want it to be stylish you want to see lighting in different sizes, shapes, and styles, lighting such as updraft lighting from color schemed floodlights. You can get lighting ideas from lighting company's websites, decoration websites, decoration magazines, and light and decoration Pinterest Boards. You can also use other types of lighting such as pin lighting or icicle lights from the ceiling, or project flood lights upon objects or pictures upon the wall. You might hang a drapery fabric using a high curtain style rod behind the head table and hang icicle lights on the back side of the hanging fabric, leaving a dramatic lighting effect. 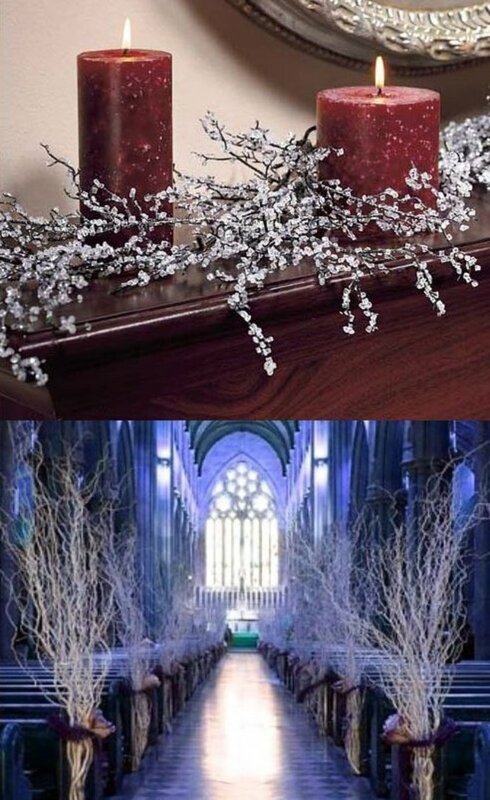 You can also decorate some bear areas around the venues with pillar lights and tea lights. The candles can be white or to your color scheme. Your pillar candles can be placed inside hurricane lamps. You can put tea lights or battery lights between table place settings to add a little effect on the reception tables. You can hang Chinese lanterns for more of a lighting effect. You can add shoestring lights under head tables, buffet tables, wedding cake table and dessert tables. 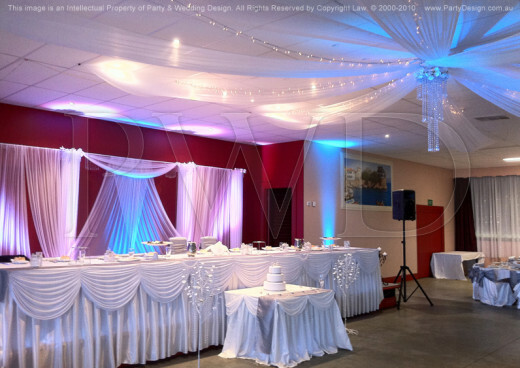 You can hang pinpoint lighting, Christmas lights, and wedding net lighting outside the entrance of the reception venue. Another way to decorate your ceiling space is with hanging drapes. For the best effect, color scheme your drapes. Some venues are just out of reach and cannot be easily decorated. Tulle and gossamer are great products for decorative draping. There are a couple of ways to lay out drapes on the ceiling. You can start in the middle of the ceiling and secure pieces of fabric with a drapery hook. Start from the middle of the ceiling and attach the fabric to where the ceiling and wall meet. Create a pattern of hanging fabrics in a circle starting from the center. When you hook fabric around the room it should end up looking like a middle eastern romantic tent. Another way to hang fabrics is by hooking wires from one side of the room to the other side of the room in a straight line in equivalent distances and hang fabrics over the hanging wires. Another idea to to hang ten fabrics in a straight line using a highly placed curtain rod. Gather 5 fabrics to the left side and secure the fabrics with a silk bow, then gather 5 fabrics to the right side and secure those fabrics with a silk bow. This creates a beautiful background for your head table that grabs attention. You want plenty of lights, candles, and hanging fabrics, but don't go too overboard which can take the look of wow to a look of being too busy. Create neat reception table centerpieces and this completes a stunning wedding reception space that says wow. You should try to color scheme your reception table centerpiece too. When you create your table centerpieces, you want the table centerpiece to be displayed either high or low. You don't want the table centerpiece to block the view of wedding guests as they talk across the table. If the ceiling is low, you might be better with a low centerpiece, if the ceiling, a high centerpiece can really make the venue really look enchanting. There are thousands of ways to decorate your wedding table centerpieces. You can get many ideas on how to create them from Youtube videos. Below are some ideas of decorative pieces that you can use to create a your table centerpiece. For the base of your wedding reception centerpiece you can use Eiffel tower vases, trumpet tower vases, martini tower vases, lamp shade tower vase, pedestal tower vase, flared tower vase, a glass cylinder, tall or shot vases, candelabras, Bali umbrellas , cube vases, or glass bowls. 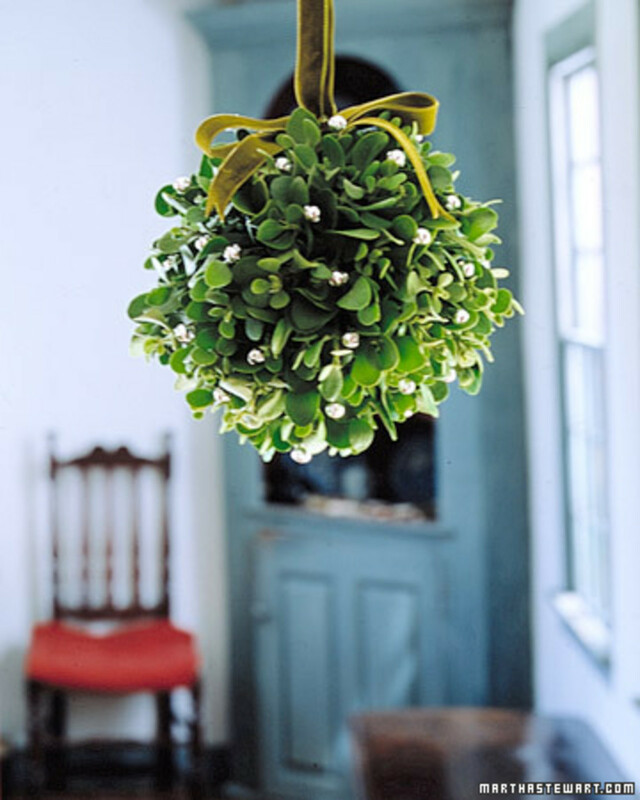 Often the table centerpieces sits on a square, octagonal, oval, or round mirror. Placed on the mirrors might be a flowers, a flower arrangement, flower petals, wedding confetti, small pictures of the wedding couple when they were young, tea light candles, or a triad of candles at differing heights. Inside the wedding reception centerpiece you might color scheme using colorful stones, marbles, water beads, gemstones, aquarium stones, river rocks, aquarium granite, flowers, aquarium plants or colored fruit. To really enhance the look you might add light to the inside of the tower vases. There are different types of lights you can use including submersible lights, submersible tea lights, pillar candles, floralytes, water pearls, fairy lights, Christmas lights and you could have flood lights pointing at the reception centerpiece. Almost any lighting you use will create a dazzling effect. You might want to decorate the top of your wedding reception centerpieces. You can decorate the tops of the centerpiece towers with long stemmed flowers, spray painted tree branches, a floral arrangement, colored ostrich feathers, Chinese lanterns, lamp shades, plant decorations, wedding bouquets, or some object that is a wedding couple's hobby. My personal favorite decoration is start with an Eiffel tower vase, on the bottom of the tower place a floralyte, load the inside with water beads, and on top use floral clay to secure ostrich feathers all color schemed. The wedding reception centerpiece ends up looking just like a palm tree. You also might think of having lights surrounding ice sculptures around your salad bar or dessert bar. You can use use mini flood lights or pin lights creating a visual effect. Don't forget to take pictures, the ice sculpture only lasts til the sound of midnight, then be gone forever just like your wedding day. Set up a wedding table centerpiece on all your reception tables, and two that are bookends for your head table. 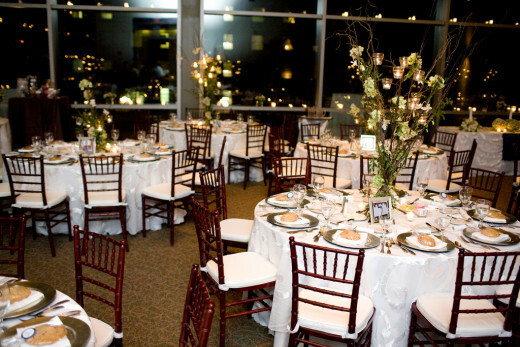 Now your wedding reception space is complete and ready to wow your wedding guests.